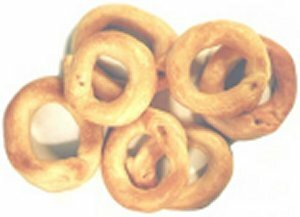 Taralli are a hard round biscuit (biscotti) very popular in Panni. Many versions can be made but ingredients most always include anise seeds and coarse black pepper. The addition of Fennel seeds is also common. They are usually served with a glass of wine or as an accompaniment to antipasto. The procedure requires two steps, a boiling step and a baking step. 2 teaspoons anise seeds, coarse black pepper or a combination. Mix all the dry ingredients well and add the eggs, wine and oil until a soft ball of dough is formed; if the dough is too wet, add a little more flour. Pinch off small rounds of dough the size of a small egg and roll them into 5-inch ropes. Bring the ends together to form a circle and place on cloth towels as you form them. Drop a few at a time in a pot of salted boiling water and, when they float to the top, remove them with a slotted spoon and lay them on a greased baking sheet. Bake them in a preheated 350ºF oven for about 20 minutes.